Words. A sound or combination of sounds that has a meaning behind it. Whether we realize it or not, words have so much power that can either bring us down or build us up. When words are being used in a proper way at the right time, they can encourage, give people hopes and confidence. Sometimes, they even can actually be life changing for some people. By speaking the right and positive words, we can bring joy to our own lives and other people’s lives. But on the other hand, by speaking negatively through words too, we can bring sorrow, anger, or even disappointment in our own lives and other people’s lives. As it is written in Matthew 12:36-37, “And I tell you this, you must give an account on judgment day for every idle word you speak. The words you say will either acquit you or condemn you.”, we need to understand how important it is to choose and to use our words wisely in our every day’s lives. Maybe after reading the first paragraph, you will start questioning “Really? Is that really true? How powerful mere, simple words actually can be?” Let’s look from the very beginning. In Genesis 1:1 to 3, God says, “In the beginning God created the heavens and the earth. The earth was formless and empty, and darkness covered the deep waters. And the Spirit of God was hovering over the surface of the waters. Then God SAID, “Let there be light,” and there was light.” Here is the key! If we read the rest of the Genesis chapter 1 from verse 1 to 31, we are going to realize that God creates everything using His words. He SAID “Let the waters beneath the sky flow together into one place, so dry ground may appear.” And that is what happened! Words have so much power beyond what you can actually imagine. That’s why, each of us needs to be careful about what we are going to say. Ask God to give you wisdom to choose your words wisely since the words that you speak today can even become your reality and your future. You never know how much appreciation and positive words can affect other people’s lives. Maybe they are struggling about something that you do not know or maybe they lack of some confidence. But, your genuine heart and positive words may bring some encouragement and hopes for them and can even change their lives! 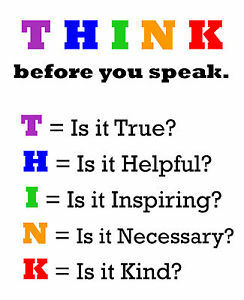 From now on, let’s us together start thinking and talking positively in our daily lives. Just starting with something small such as replace your negative vocabulary into a positive ones does not hurt since you never know how and when God will using your words to change people’s lives! Older PostI Need My Breakthrough Right Now!